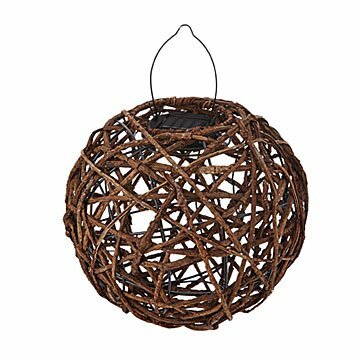 The natural glow of this woven rattan sphere and the intricate pattern of shadows it casts bring light and beauty to barbecues, garden parties, or lazy evenings on the porch swing. Inside is a solar-powered, low-energy LED that automatically turns on as the sun goes down, and the sphere is hand-woven using sustainable materials. Made in China. Do not expose to extreme temperatures. Bring indoors in winter weather. Light lasts 4-6 hours, after a full 6-8 hour charge in direct sunlight. One AAA NiMH rechargeable battery included.